BuBclean is one of the 75 innovative companies that symbolically received a tree at the Lane of Innovation in Enschede. The Lane of Innovation is an honorary titel for the Hengelosestraat in Enschede, assigned to it last year by Kennispark Twente in order to publicly appraise the innovativeness of the local companies. The trees represent sustainable growth of innovative companies in and from Twente. 75 trees were already awarded in 2012; this year another 75 trees will be assigned. Kennispark Twente also considered BuBclean worthy of a tree. The celebration took place on November 28th, together with festivities in honour of the award for ‘Best Businesspark of the Netherlands 2013’. 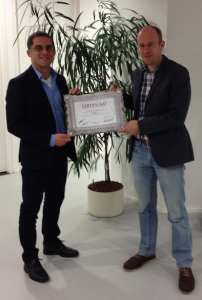 BuBclean is honoured and thankful for the ‘Lane of Innovation’ tree and is proud to be part of Kennispark Twente.